As someone who loves to cook, finding a good way to store my recipes has been an ongoing challenge. There are so many options out there, I refuse to pay for a service just to organize my recipes. Yes, I’m sure some of the paid programs and apps are great, and can do more than the free services. But it’s just not something I can fork out my heard-earned money for. Anyways, there are a bunch of different ways to store your recipes in a digital format. I have tried a few throughout the years, and have settled on one for now. Each time I have changed, has meant retyping all of my recipes. Though it also gave me a chance to go through the recipes and update any that I have changed as I’ve cooked, and removed any that we don’t make anymore. Pepperplate.com is the service that I am currently using for my recipes. I found it a couple months ago when I was looking for a new way to store my recipes. Overall, it does most of what I need for recipe storage. I tried a few different websites and methods, and this won out because it had more pros than cons. The other free website for recipe storage that I tried is spoonacular.com. This one almost won out, but in the end it had too much going on. Some of the features were interesting, and could be helpful, but it was more than I needed. I like a simple interface, and this one was too cluttered for my liking. I know a lot of people who say they have their recipes on pinterest. Personally, I find that this is a great place for finding new recipes, but it’s not a great storage option long-term. Another possibility for recipe organization is to use Google Docs or something similar. You have to type the recipes in all as different documents, which then becomes a little cluttered. Using Word documents would be very similar to using Google Docs. Word just isn’t backed up on a cloud like Google Docs. Until about a month ago, Evernote was easily my go-to for my recipe storage. I loved the interface and how easy it was to share the recipes, but they started charging after uploading so much. All I did one month was update the photos with some of my recipes, and I got a warning that I hit my limit and needed to pay to upgrade. That’s when I started looking for another option. I have so many recipes that sometimes I am lost finding them. I am thankful for this post. I use a word doc within google docs but you are so right about it being disorganized. I never would have thought to search for an app. I will have to give Pepperplate a try! I am a huge fan of writing down everything on paper. However, it seems that it’s no longer the best way to store data anymore. I have already used Pinterest and Google docs for a while, may be I should give the other app and webs a try. 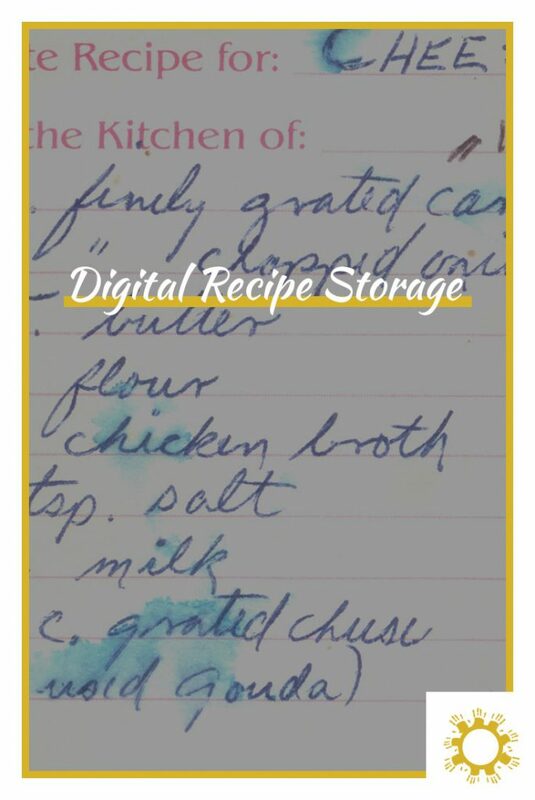 apart from my blog which serves as a digital recipe book I never thought of another digital recipe storage! How did I not think of that before? Thank you for the idea,I will try spoonacular it sounds awesome! This is such a good idea! I will have to try one of these. Sometimes I think it’s still easier to just have a binder of printed out recipes! Are these free options? I have been looking for something like this to keep me more organized but just dont have the extra funds right now. Yes, last I checked they are all free! Or at least have a working free version. That’s seems interesting, I haven’t used any of these and I guess I will try one of it soon. This is so great!! Thank you for doing my homework for me, I have needed to find something for this. Saving recipes digitally is definitely tough. You have no idea what is ABSOLUTELY going to be accessible to you later.